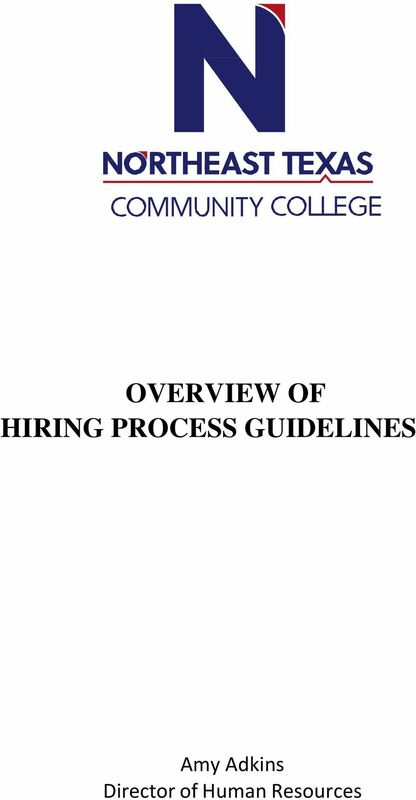 Download "OVERVIEW OF HIRING PROCESS GUIDELINES"
3 Note: These guidelines have been prepared for employees and supervisors as a reference regarding employment procedures necessary to insure that the college functions in a consistent and effective way. The guidelines have been derived from the Northeast Texas Community College Policy Manual, which is considered the final reference for current information. 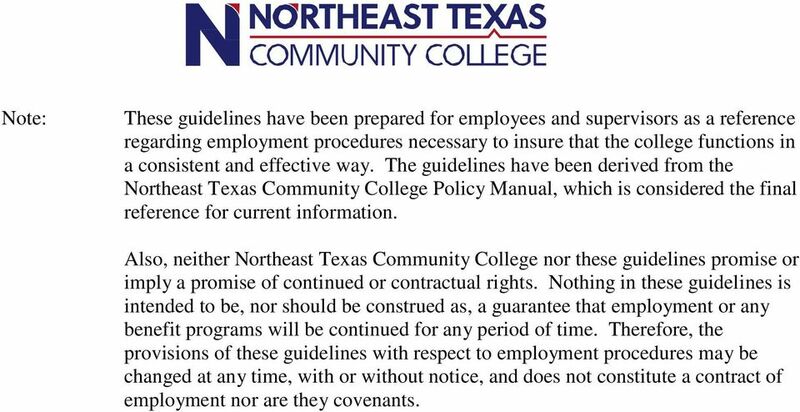 Also, neither Northeast Texas Community College nor these guidelines promise or imply a promise of continued or contractual rights. Nothing in these guidelines is intended to be, nor should be construed as, a guarantee that employment or any benefit programs will be continued for any period of time. Therefore, the provisions of these guidelines with respect to employment procedures may be changed at any time, with or without notice, and does not constitute a contract of employment nor are they covenants. 4 Guidelines for Employment Selection Process Full Time Employees Instructions: This is a checklist to follow to fill a full-time vacancy. The Human Resources Office may be contacted for assistance at any point in this process. I. POSITION VACANCY RESIGNATION / TERMINATION OF CURRENT EMPLOYEE Employee submits letter of resignation to immediate supervisor. Or in case of termination, appropriate documentation is forwarded to Human Resources office. Immediate supervisor notifies appropriate administrators. Immediate supervisor forwards letter of resignation / termination to Human Resources Office. EMPLOYMENT PROCESS INITIATED Vice President or appropriate administrator reviews the open position with appropriate supervisors to reaffirm necessity of continuing the position. Vice President or appropriate administrator notifies Human Resources Office to begin Employment Process. JOB DESCRIPTION & VACANCY ANNOUNCEMENT PREPARED Human Resources Office provides appropriate administrator with copy of current job description if administrator not in possession. Appropriate administrator and supervisors consults incumbent, reviews and revises, when appropriate, the job description. Revised job description is forwarded to appropriate Vice President for approval. Vice President forwards revised job description to President for approval. Revised job description with appropriate approval signatures is forwarded to Human Resources. 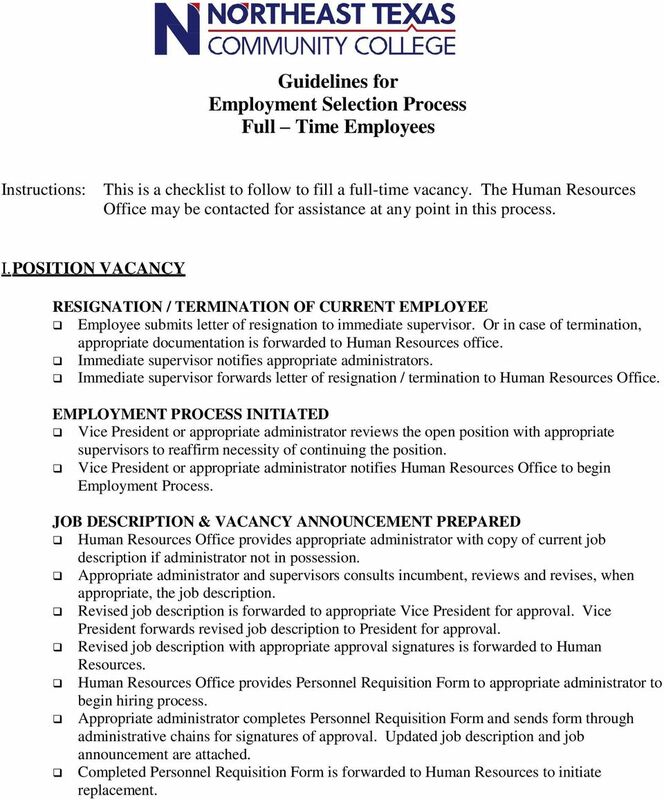 Human Resources Office provides Personnel Requisition Form to appropriate administrator to begin hiring process. Appropriate administrator completes Personnel Requisition Form and sends form through administrative chains for signatures of approval. Updated job description and job announcement are attached. Completed Personnel Requisition Form is forwarded to Human Resources to initiate replacement. 5 II. 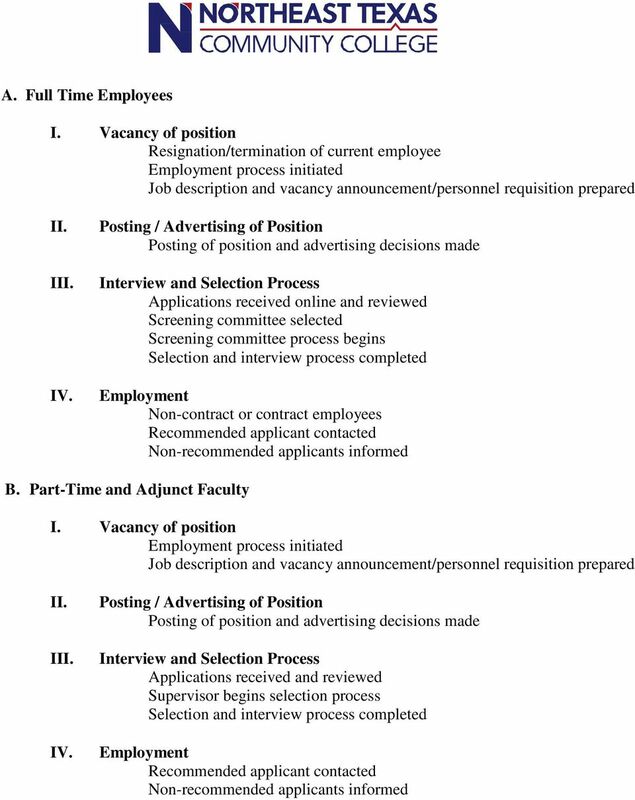 P0STING / ADVERTISING POSITION POSTING AND ADVERTISING DECISIONS MADE Human Resources initiates posting position vacancy/personnel requisition announcement. Appropriate supervisor makes advertising selections in consultation with Human Resources Office. III. INTERVIEW AND SELECTION PROCESS APPLICATIONS RECEIVED AND REVIEWED All applications must be completed online to be considered for any posted/advertised positions. Director of Human Resources and College Relations will review quality of applications and if needed re-advertise or advertise in an expanded market. Human Resources release of only minimally qualified applications to screening committee online. Initial screening of applications will take place in the administration building Copies of the application packets will not be provided to each committee member. Committee members will be granted access to view the applications online. SCREENING COMMITTEE SELECTED Appropriate supervisor RECOMMENDS screening committee members to the Director of Human Resources and appropriate administrator. Director of Human Resources and appropriate administrator approve selection of committee members. Screening Committees should be comprised of a representative from faculty, professional/administrative, and classified positions as well as the direct supervisor of the open position. The committee will have minority representation. (Usually a total of 3-6 persons.) 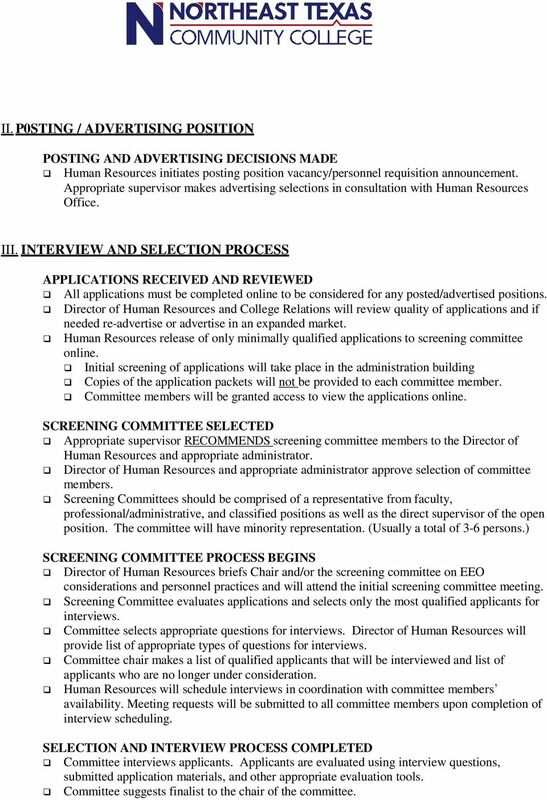 SCREENING COMMITTEE PROCESS BEGINS Director of Human Resources briefs Chair and/or the screening committee on EEO considerations and personnel practices and will attend the initial screening committee meeting. Screening Committee evaluates applications and selects only the most qualified applicants for interviews. Committee selects appropriate questions for interviews. Director of Human Resources will provide list of appropriate types of questions for interviews. Committee chair makes a list of qualified applicants that will be interviewed and list of applicants who are no longer under consideration. Human Resources will schedule interviews in coordination with committee members availability. Meeting requests will be submitted to all committee members upon completion of interview scheduling. SELECTION AND INTERVIEW PROCESS COMPLETED Committee interviews applicants. Applicants are evaluated using interview questions, submitted application materials, and other appropriate evaluation tools. Committee suggests finalist to the chair of the committee. 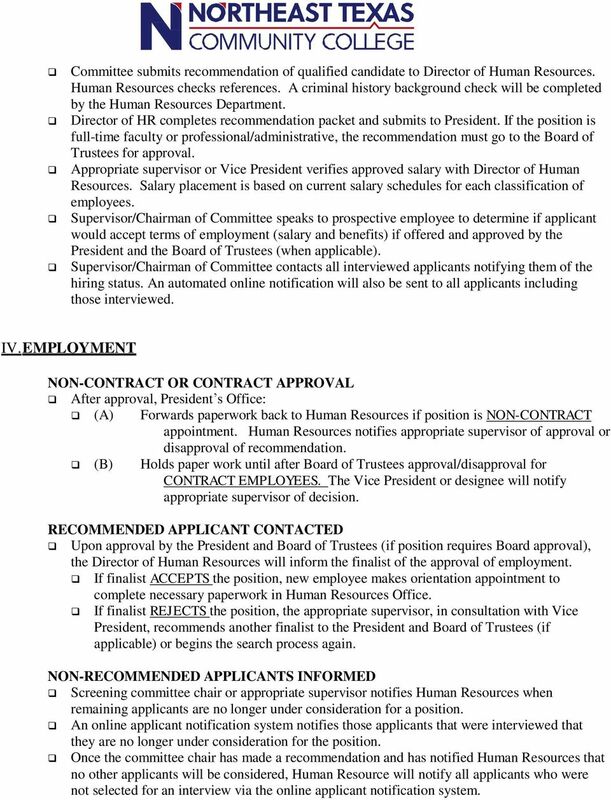 6 Committee submits recommendation of qualified candidate to Director of Human Resources. Human Resources checks references. A criminal history background check will be completed by the Human Resources Department. Director of HR completes recommendation packet and submits to President. If the position is full-time faculty or professional/administrative, the recommendation must go to the Board of Trustees for approval. Appropriate supervisor or Vice President verifies approved salary with Director of Human Resources. Salary placement is based on current salary schedules for each classification of employees. Supervisor/Chairman of Committee speaks to prospective employee to determine if applicant would accept terms of employment (salary and benefits) if offered and approved by the President and the Board of Trustees (when applicable). Supervisor/Chairman of Committee contacts all interviewed applicants notifying them of the hiring status. An automated online notification will also be sent to all applicants including those interviewed. IV. EMPLOYMENT NON-CONTRACT OR CONTRACT APPROVAL After approval, President s Office: (A) Forwards paperwork back to Human Resources if position is NON-CONTRACT appointment. Human Resources notifies appropriate supervisor of approval or disapproval of recommendation. (B) Holds paper work until after Board of Trustees approval/disapproval for CONTRACT EMPLOYEES. The Vice President or designee will notify appropriate supervisor of decision. RECOMMENDED APPLICANT CONTACTED Upon approval by the President and Board of Trustees (if position requires Board approval), the Director of Human Resources will inform the finalist of the approval of employment. If finalist ACCEPTS the position, new employee makes orientation appointment to complete necessary paperwork in Human Resources Office. If finalist REJECTS the position, the appropriate supervisor, in consultation with Vice President, recommends another finalist to the President and Board of Trustees (if applicable) or begins the search process again. 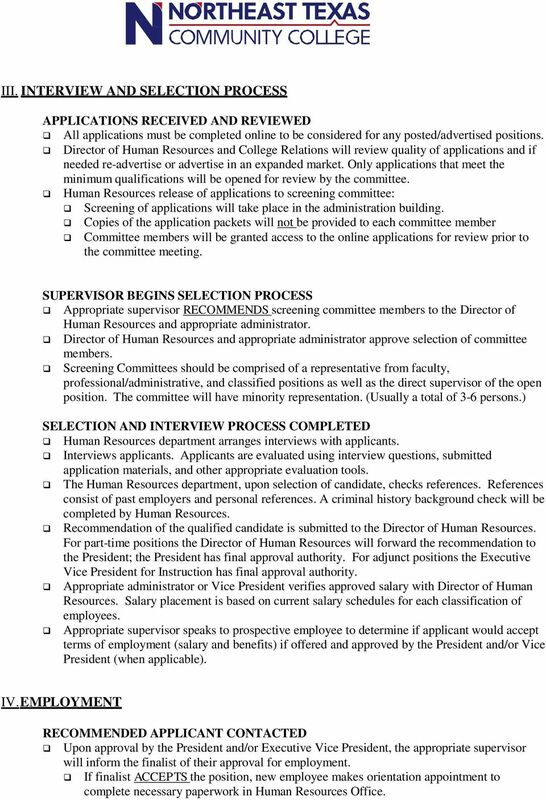 NON-RECOMMENDED APPLICANTS INFORMED Screening committee chair or appropriate supervisor notifies Human Resources when remaining applicants are no longer under consideration for a position. An online applicant notification system notifies those applicants that were interviewed that they are no longer under consideration for the position. Once the committee chair has made a recommendation and has notified Human Resources that no other applicants will be considered, Human Resource will notify all applicants who were not selected for an interview via the online applicant notification system. 7 Northeast Texas Community College Guidelines for Employment Selection Process Part Time and Adjunct Employees Instructions: This is a checklist to follow to fill a part-time or adjunct vacancy. The Human Resources Office may be contacted for assistance at any point in this process. I. POSITION VACANCY EMPLOYMENT PROCESS INITIATED Vice President or appropriate administrator reviews the open position with appropriate supervisors to reaffirm necessity of continuing the position. Vice President or appropriate administrator notifies Human Resources Office to begin Employment Process. JOB DESCRIPTION & VACANCY ANNOUNCEMENT PREPARED In most cases job descriptions will not be required. However, vacancy announcements/personnel requisitions will be prepared. If the job description is required, the Human Resources Office provides appropriate administrator with a copy of the current job description if administrator not in possession. Appropriate administrator and supervisors consults incumbent, reviews and revises, when appropriate, the job description. Revised job description is forwarded to appropriate Vice President or administrator for approval. The administrator forwards revised job description to President for approval. Revised job description with appropriate approval signatures is forwarded to Human Resources. For part-time employees the Human Resources Office provides the Personnel Requisition Form to appropriate administrator to begin process. 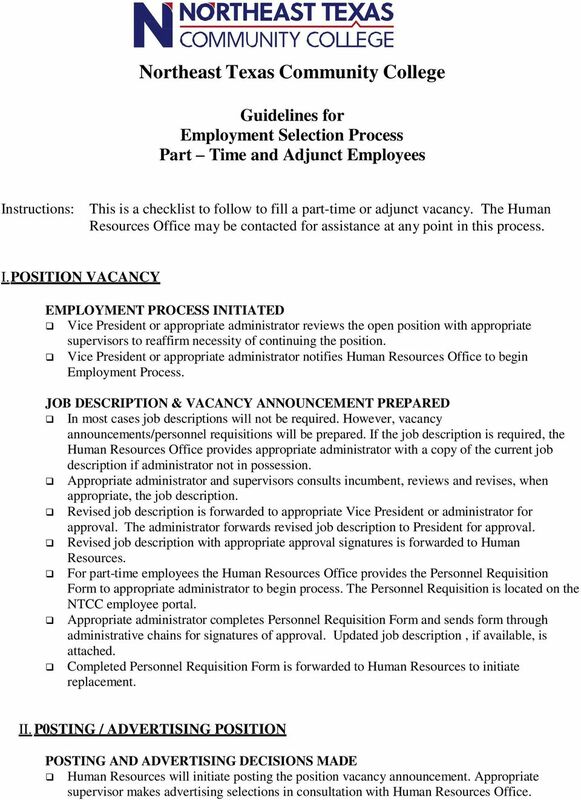 The Personnel Requisition is located on the NTCC employee portal. Appropriate administrator completes Personnel Requisition Form and sends form through administrative chains for signatures of approval. Updated job description, if available, is attached. Completed Personnel Requisition Form is forwarded to Human Resources to initiate replacement. II. P0STING / ADVERTISING POSITION POSTING AND ADVERTISING DECISIONS MADE Human Resources will initiate posting the position vacancy announcement. Appropriate supervisor makes advertising selections in consultation with Human Resources Office. 8 III. INTERVIEW AND SELECTION PROCESS APPLICATIONS RECEIVED AND REVIEWED All applications must be completed online to be considered for any posted/advertised positions. Director of Human Resources and College Relations will review quality of applications and if needed re-advertise or advertise in an expanded market. Only applications that meet the minimum qualifications will be opened for review by the committee. Human Resources release of applications to screening committee: Screening of applications will take place in the administration building. Copies of the application packets will not be provided to each committee member Committee members will be granted access to the online applications for review prior to the committee meeting. SUPERVISOR BEGINS SELECTION PROCESS Appropriate supervisor RECOMMENDS screening committee members to the Director of Human Resources and appropriate administrator. Director of Human Resources and appropriate administrator approve selection of committee members. Screening Committees should be comprised of a representative from faculty, professional/administrative, and classified positions as well as the direct supervisor of the open position. The committee will have minority representation. (Usually a total of 3-6 persons.) SELECTION AND INTERVIEW PROCESS COMPLETED Human Resources department arranges interviews with applicants. Interviews applicants. Applicants are evaluated using interview questions, submitted application materials, and other appropriate evaluation tools. The Human Resources department, upon selection of candidate, checks references. References consist of past employers and personal references. A criminal history background check will be completed by Human Resources. Recommendation of the qualified candidate is submitted to the Director of Human Resources. For part-time positions the Director of Human Resources will forward the recommendation to the President; the President has final approval authority. For adjunct positions the Executive Vice President for Instruction has final approval authority. Appropriate administrator or Vice President verifies approved salary with Director of Human Resources. Salary placement is based on current salary schedules for each classification of employees. Appropriate supervisor speaks to prospective employee to determine if applicant would accept terms of employment (salary and benefits) if offered and approved by the President and/or Vice President (when applicable). IV. EMPLOYMENT RECOMMENDED APPLICANT CONTACTED Upon approval by the President and/or Executive Vice President, the appropriate supervisor will inform the finalist of their approval for employment. If finalist ACCEPTS the position, new employee makes orientation appointment to complete necessary paperwork in Human Resources Office. POSTING REQUIREMENTS: The Personnel Requisition Form initiates the recruitment process for all open positions. When Completed: This procedure is performed whenever personnel actions are needed. The following committees may have members in common or be disjoint, depending on the decision of the Center/Area faculty members. Form names which are bolded can be found on the Liaison Resources page (http://www.tamhsc.edu/payroll-hr/liaisons.html). AU HIRING PROCESS. Contact Public Relations for external advertising and listing the job on higheredjobs.com. 1. The College strives to attract the best qualified candidates through the uniform application of its selection procedures. Recruitment & Selection Guide Life University Human Resources 1269 Barclay Circle Marietta, GA 30060 (770) 426-2930 Table of Contents I. THE PURPOSE...3 II. RECRUITMENT AND SELECTION FRAMEWORK... 4 A.